Heat oven to 350°F. Grease a 12-cup bundt pan with cooking spray. In a small saucepan over medium heat, melt butter and 1/4 cup coconut milk until smooth. Remove from heat. Separate both cans of dough into biscuits. Cut each biscuit into fourths. Carefully dip each biscuit piece into butter mixture, then roll in sugar and place in prepared bundt pan. Cover entire bottom of pan with a layer of about 20 biscuit pieces, then sprinkle half of the crushed pineapple over the top. Top pineapple with another layer of dipped and rolled biscuits, then sprinkle the rest of the pineapple on top. Top pineapple with remaining dipped and rolled biscuits. Bake until deep golden brown on top and a toothpick inserted in the center comes out mostly clean, about 35 minutes. Transfer to a cooling rack; cool 10 minutes in pan. Carefully invert monkey bread onto a plate. In a small bowl, whisk together powdered sugar and remaining 3 tablespoons coconut milk until smooth, like a glaze. 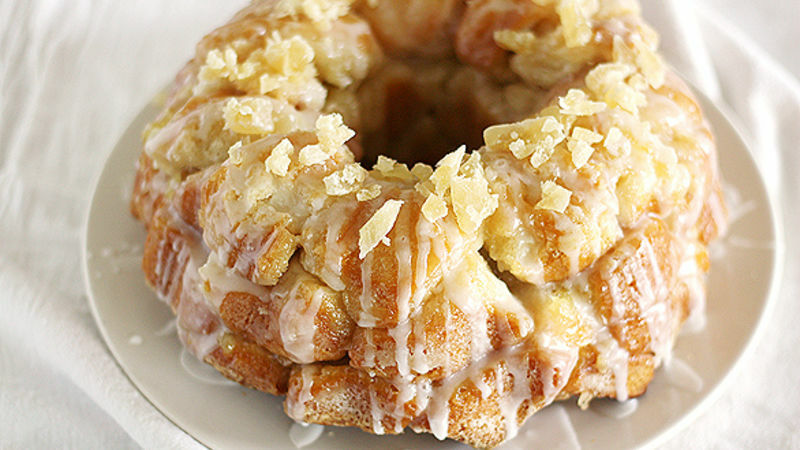 Drizzle glaze over warm monkey bread. Top with chopped dried pineapple; serve warm. What you see here isn’t just monkey bread. It isn’t even just dessert. What you see is one of the most tantalizingly delicious, the most amazingly decadent, the most unbelievably difficult-to-restrain-yourself-from-eating-the-whole-thing-in-one-sitting creations I’ve ever made in my kitchen. Ladies and gentlemen, this is Piña Colada Monkey Bread and it will change your life. Maybe I’ve given this thing too much expectation to live up to, but – welp, no, no I haven’t. It really is that good. Of course, you can thank the Pillsbury biscuits, the butter, the sugar and the coconut milk for that. And the sweet pineapple tucked inside. And the coconut glaze. Basically, all the things contribute to what may be my complete downfall as far as bikini season goes. WORTH IT. First, round up the ol’ ingredients. We’ve got Pillsbury Grands! Biscuits (anyone else terrified when those things pop open? Nope? Just me? ), butter, sugar, canned pineapple, coconut milk and dried pineapple – all the fixins for a dang good piña colada-flavored dessert. Melt the butter and the coconut milk together, then cut up the biscuits into quarters. Dip each biscuit piece into the butter mixture, then give it a roll in the sugar and place it in the bottom of a greased bundt pan. Repeat until you’ve covered the bottom of the bundt pan. Sprinkle half of the drained canned pineapple (make sure you drain it well, otherwise it’ll make the bread soggy and no one likes that) on top of the first layer of biscuits. Top the pineapple with another layer of dipped and rolled biscuits, then sprinkle the remaining pineapple on top. Finally, top it all off with the final layer of dipped and rolled biscuits. Bake the bread until it’s a deep golden brown on top and a skewer inserted in the center comes out mostly clean, about 35 minutes. Transfer to a cooling rack to cool 10 minutes. When the bread has cooled, carefully invert it onto a serving plate. While the bread is still warm, drizzle the coconut milk glaze all over the top of it. Finally, sprinkle it with dried pineapple. Now is the moment when you, too, will realize that this may be the beginning of a beautiful friendship – between you and monkey bread. Your swimsuit? Not so much. Stephanie (aka Girl Versus Dough) can’t stress this enough: Make the dang monkey bread. Kthanksbye. Check out Stephanie’s Tablespoon member profile and keep checking back for her own personal recipes on Tablespoon!